This same kind of charisma of infallibility, that which is attatched to an office and not simply unpredictably given by God to the common man, seems to be present in the Old Covenant as well. DISCLAIMER THIS IS NOT FRINGE: Many Catholics, like Dr. Scott Hahn, have admitted the parallelism/typology between Old Covenant and New Covenant, I want to understand the Old Testament side of this particular parallel better. I will be quoting some verses from the NT for the skeptics of this particular parallel, as anyone is welcome to answer whether Catholic, Protestant or Orthodox. 1 Then Jesus spoke to the multitudes and to his disciples, 2 Saying: The scribes and the Pharisees have sitten on the chair(cathedra) of Moses. 3 All things therefore whatsoever they shall say to you, observe and do: but according to their works do ye not; for they say, and do not. 46 But some of them went to the Pharisees, and told them the things that Jesus had done. 47 The chief priests therefore, and the Pharisees, gathered a council, and said: What do we, for this man doth many miracles? 48 If we let him alone so, all will believe in him; and the Romans will come, and take away our place and nation. 49 But one of them, named Caiphas, being the high priest that year, said to them: You know nothing. 50 Neither do you consider that it is expedient for you that one man should die for the people, and that the whole nation perish not. 51 And this he spoke not of himself: but being the high priest of that year, he prophesied that Jesus should die for the nation. 52 And not only for the nation, but to gather together in one the children of God, that were dispersed. 53 From that day therefore they devised to put him to death. 1 What advantage then hath the Jew, or what is the profit of circumcision? 2 Much every way. First indeed, because the words of God were committed to them. 3 For what if some of them have not believed? shall their unbelief make the faith of God without effect? God forbid. 4 But God is true; and every man a liar, as it is written, That thou mayest be justified in thy words, and mayest overcome when thou art judged." QUESTION: I would like to know the Old Testament basis and/or the ancient Jewish historical basis for the reasoning behind the understanding of the New Testament writers concerning Jewish clerical infallibility. --- Yes the New Testament is inspired, but if you did not notice God rarely if ever inspires people by automatic writting like demons so often do with their ministers. So there is a human cooperation which needs to be taken into account. If in doubt, there is a much more exhaustive exposition article on this subject which I wrote and can be found here. ⚠ WARNING ⚠: I will only accept answers which do not debate the premises of the Question, all answers which contest the premises will be ignored de facto. I do not care about corruption in the Jewish ranks, that is besides the point. Thank you. Caiphas, although nominally high priest that year, did not sit on the chair of Moses, because he did not teach the Law of Moses. Also, "the scribes and the Pharisees have sitten on the chair of Moses" (Mt. 23:2) cannot apply to Caiaphas; the scribes were not priests, and Caiaphas was not a Pharisee. A chair properly belongs to a teacher; and so they are said to sit upon his chair, who are the successors of Moses; “Moses commanded a law in the precepts of justices” (Eccle. 24, 33). Hence, they who were teaching the Law of Moses were sitting upon the chair of Moses. And in this Law are contained certain things pertaining to the end, and certain things pertaining to good morals. Those things, which were pertaining to the end, are those in which Christ was prefigured; hence, He Himself says, “If you did believe Moses, you would perhaps believe me also” (Jn. 5, 46). Likewise, the moral precepts were contained in the Law; “Moses commanded a law in the precepts of justices” (Eccle. 24, 33). This Caiphas was the priest of that year, according to Jerome, and according to that which is stated: “Being the high priest that year” (Jn. 11, 49). For, at that time, the priesthood was not being treated according to the precepts of the Law. The Lord had commanded that Aaron and his sons would be priests by a hereditary right, such that when one died another priest would replace him. But afterwards, when the Jews’ ambition grew, they were unable to bear the Law, and when Judea became subject to the Romans, this Caiphas bought the priesthood from the Jews and he bought it from Pilate; wherefore, the leader was wicked. Caiphas was appointed High-Priest of the Jews by the Roman procurator Valerius Gratus, the predecessor of Pontius Pilate, about A.D. 18 (Ant., XVIII, ii, 2), and removed from that office by the procurator Vitellius, shortly after he took charge of affairs in Palestine, A.D. 36 (Ant., XVIII, iv, 3). During this period the famous Annas, father-in-law of Caiphas (John 18:13), who had been high-priest from A.D. 6 to 15, continued to exercise a controlling influence over Jewish affairs, as he did when his own sons held the position. He was thus a political puppet who lacked spiritual authority, even if he did correctly prophesy. the Jewish High Priest had not that infallible assistance of the Holy Ghost which the Christian High Priests have from Christ and after Christ. It is, moreover, especially to be borne in mind that at that time, Christ being come, the Jewish Synagogue was beginning to fall, and Christ's Church to rise up in its place. For shortly after this Caiaphas with the whole council of the Sanhedrim proclaimed Jesus to be guilty of death as a false Messiah. This was an error in the Faith. Wherefore their Synagogue then ceased to be the Church of God, and began to be the synagogue of Satan which denied and slew the Christ which was sent by God. The High Priest Joseph Caiaphas was a puppet priest, put into office by the Romans. Caiaphas did not have the power of speaking on the level of infallibility as does the Pope when speaking on faith and morals. In your question you state that Caiaphas, as high priest, declares an infallible statement by the power of the chair of Moses. Yet you do not support your claims. Yes, he was High Priest that year, but named so by Roman authority, not Divine. The use of infallibility in Catholic theology is rather restrictive; it is a Catholic dogma and has been taught through the ages. It means that, by Divine assistance, the Church (of Christ), is preserved from error, or even the possibility of error, in definitive dogmatic teachings regarding faith and morals. This does not mean that individual believers are infallible in their subjective interpretations and it does not require a holiness of life after all, Caiaphas was given the greater gift of prophecy when he condemned Christ. Surely a lesser gift would not require more. Christ intended every person to be part of His Church and that the Church be one in faith and worship. In doing so, He established a visible Church and gave authority to the apostles and their successors, exclusively, in order to teach and govern. Infallibility differs from inspiration in that inspiration is a special Divine influence that not only preserves from error (inerrant) but controls what the subject can say or write as the Word of God. Inspiration directly makes God the author of inspired utterances whereas infallibility only preserves the subject from error. In the case of infallibility, God is not the author. The power of binding and loosening was claimed by the Pharisees, but not in the exact sense that the Catholic Church employs the term. The following is from the Jewish Encyclopedia! The power of binding and loosing was always claimed by the Pharisees. Under Queen Alexandra, the Pharisees, says Josephus ("B J." i, 5, § 2), "became the administrators of all public affairs so as to be empowered to banish and readmit whom they pleased, as well as to loose and to bind." This does not mean that, as the learned men, they merely decided what, according to the Law, was forbidden or allowed, but that they possessed and exercised the power of tying or untying a thing by the spell of their divine authority, just as they could, by the power vested in them, pronounce and revoke an anathema upon a person. The various schools had the power "to bind and to loose"; that is, to forbid and to permit (Ḥag. 3b); and they could bind any day by declaring it a fast-day (Meg. Ta'an. xxii. ; Ta'an. 12a; Yer. Ned. i. 36c, d). This power and authority, vested in the rabbinical body of each age or in the Sanhedrin (see Authority), received its ratification and final sanction from the celestial court of justice (Sifra, Emor, ix. ; Mak. 23b). But what was the Seat of Moses? 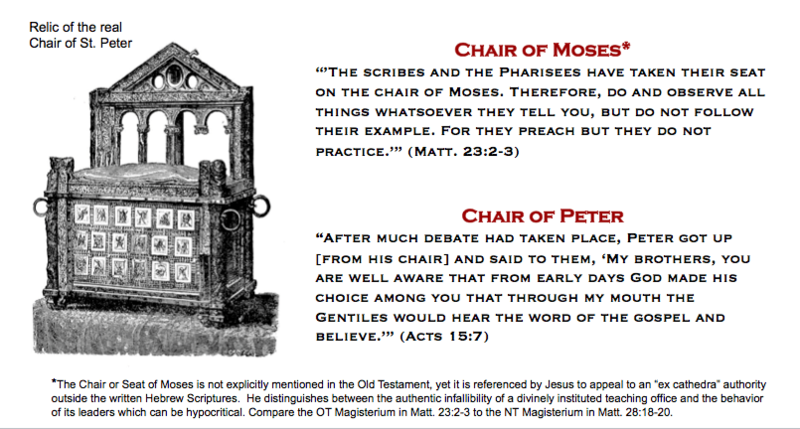 The chair of Moses was a phrase used by Jesus in Matthew 23:2 to signify the place of authority that the Scribes and Pharisees had in interpreting The Law and exercising their authority over the Jewish people. They are the ones who would tell the people of Israel what the law of Moses "really" meant. The phrase is found only in this verse. In Greek, the phrase is Μωσέως καθέδρας (Moses kathedras), and is literally "Moses' seat." It is translated as "Moses' seat" in the ASV, KJV, ESV, NET, NIV. - What is the Chair of Moses (the Seat of Moses)? The phrase of sitting on the seat of Moses seems to be more in line with a bishops authority within his own diocese than that of a pope's authority when declaring something Ex Cathedra. “The scribes and the Pharisees sit on Moses’ seat” (Mt. 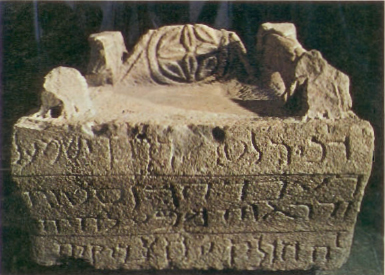 23.2), a carved stone chair reserved for a visitor or for the most distinguished elder of a synagogue. This one is from Chorazin, one of the three towns Jesus inveighed against for their citizens’ hypocrisy. In 1926 a unique stone seat was found near the southern wall of the Chorazin synagogue. Since then it has been called the “Chair of Moses.” The Chair of Moses is a special seat that is used in some synagogues, even today, on certain occasions, usually located near the most important wall, that which faces Jerusalem. Caiaphas did not exercise clerical infallibility at all, in the same way a pope exercises papal infallibility. He was a puppet High Priest under Roman authority. Your question confuses clerical infallibility with the Jewish authority (binding and loosing) of the Scribes, the Pharisees and the High priests who held office at that moment. Not the answer you're looking for? Browse other questions tagged catholicism old-testament infallibility or ask your own question. Why did it take so long for papal infallibility to be defined? What are the differences between the CRCNA position on infallibility and the ICBI position on inerrancy? What is meant by “faith and morals” with regards to papal infallibility?